IFA 2016 will serve to Archos to announce several Helium smartphones with Android 6.0 Marshmallow. They will be available in September and October at prices that vary between 120 and 160 euros, and where the mix of different types of hardware, design and quality are a strategic factor to compete in the market. These new smartphones are the Archos 50f Helium and models of the Archos 55 Helium family, consisting of Archos 55 Helium, Archos 55 Helium Four Seasons and Archos 55 Helium Ultra. This choice within the same line of cell phones seems to go a bit against the current market policy, and varying the name according to some hardware differences, such as the amount of RAM and internal memory, in a scenario where vendors tend to dilute the catalog and simplify the patterns with unique names, while in this case we get into the details of the proposal for differences versions. First we move into the low-end smartphone market, especially in regard to price, as indeed this is the flagship model, the Archos 55 Helium Ultra which features a 5.5-inch screen, will be available from October for € 159,99. We are talking about an interesting market segment, offering advantages because it does not compromises the quality based on the price of the devices. In the case of Archos 55 Helium Ultra, we find a smartphone with LTE connectivity and Dual Sim (although only runs on three frequencies in this case), based on Android 6.0, with 5.5 inches IPS (as its name suggests, useful to remember the differences between models) and resolution of 1280 x 720 pixels. The smartphone weighs 160 grams, uses a CPU MediaTek MT6737 quad-core and comes with 3 GB of RAM and 32 GB of internal memory expandable up to 128 GB. The front camera features a 2-megapixel sensor and the rear has autofocus and LED flash for 8 megapixel sensor, making a proposal now provides all the basics for foodies with an eye on the price. The included battery has 2700 mAh capacity. In any case, Archos seems to have reserved the fingerprint reader only for the 50f Helium model, smaller. However, in the rest of the proposal Archos does not differ from the solutions given for high-end smartphones in terms of design. Although, at this point, it is difficult to find an aesthetically inappropriate phone, since we are talking about a mature market. Archos focuses on the design and color and also a basic version of the 55 Helium (with only 1 GB of RAM and 16 GB of internal memory to 119.99 euros), it proposes another version with the same hardware and worse specifications than Ultra, and a third version called Four Seasons that features four interchangeable covers called Blooming Gold, Blazing Yellow, Autumn Woodland and Frosted Grey, also available from October at the same price as the basic model that will appear in September. As already mentioned, the fingerprint reader has been reserved for the model Archos 50f Helium (Android 6.0, LTE and micro dual SIM), with 5-inch screen, HD resolution, 2 GB of RAM and 32 GB of memory internal (decision we do not understand: it is strange Archos did not offer 3 GB of RAM but added fingerprint reader at the same time). This smartphone features a Qualcomm Snapdragon 210 processor and four cores running at 1.1 GHz. The multimedia section for photography includes a rear 8-megapixel camera and front camera with 2 megapixel sensor. The battery in this case has a capacity of 2000 mAh. 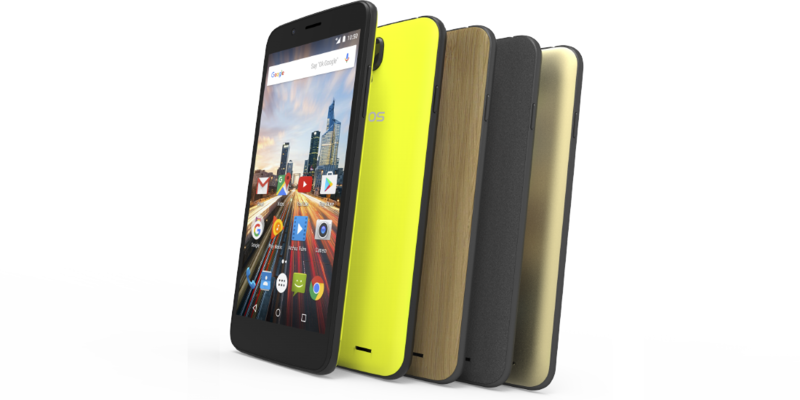 The price of Archos 50f Helium is € 129.99 and will be available in October 2016.